This recipe is actually a cake recipe. I've made it hundreds of times as a cake, but I decided to try cupcakes this time. So...why cupcakes? I've had a few friends comment about my love of cupcakes, and it's true I do love cupcakes. It was one of my daughters first words. Truth is, I love anything miniature. But there are a few other reasons I'm in love with cupcakes lately, and honestly it has nothing to do with the recent cupcake craze. I actually just really love cake, but my little family of 3 can't, or shouldn't, eat a whole cake before it goes stale. Cupcakes offer automatic portion control. When I'm cutting a slice of cake it's easy to cut a nice big slice and not feel as guilty as eating...like 3 cupcakes. I know if I have one cupcake, it's usually about 200-250 calories and I'm done. Cupcakes also freeze really well. I can make a batch, have some for dessert and freeze the rest for another day. And lastly, cupcakes are fun and easy to share. I can make a batch of cupcakes, eat some for dessert, and share the rest with neighbors and friends. What's better than that? So I say...Let them eat cake...cupcakes! Juice of 2 oranges (about ½ C.) with water added to make 1C. 1. In a mixing bowl, combine the flour, sugar, baking powder and soda. 2. Add the butter, orange juice and rind, beat for 2 minutes. 3. Add the eggs and beat an additional minute. 4. Pour into 2 greased and floured 8 inch cake pans, 24 muffin tins, or 1 bunt pan. Bake the 8 inch cakes or the bunt cake at 375 degrees for 25 minutes; the muffins at 350 for 20 minutes. 5. 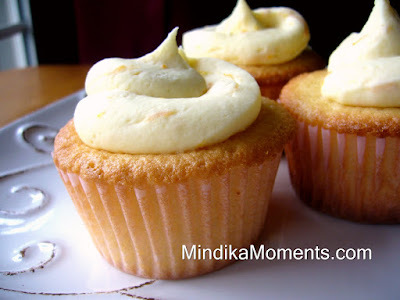 When cool, frost with orange butter cream frosting. 1. In a mixing bowl, beat the butter with the orange juice, zest and vanilla. 2. Add confectioner’s sugar until the frosting reaches desired consistency. I didn't know that cupcakes froze well!!! Yay, that's great news. I made your rainbow cupcakes the other day instead of your Reese's Peanut butter(that will be for father's day). I bought the neon gel coloring and it worked wonderfully! Can you freeze them after they have been frosted? I love these cupcakes. Thanks for sharing. They are beautiful and delicious.